With a growing radio market, how do you identify the best CB radio for truckers? While there are many options, some quality radios don't hold up to the expectations of a trucker who depends on their CB radio for important communications. Whether you're buying your first CB radio as a new truck driver or you have some experience but want something with more advanced features, our CB radio reviews will point you in the right direction. Our goal is to provide the information that you need to select the right CB radio for your truck. Our honest CB radio reviews are designed to highlight the pros and cons of the leading models from some of the most respected manufacturers. We chose these three radios because we believe their features are suitable for the needs of a truck driver. If there's one thing that can get the attention of a truck driver, it's shiny chrome. When you take one look at the chrome exterior of the Cobra 29 LTD CHR CB radio, you see why it's one of the most popular options for truck drivers today. Even the microphone is encased in chrome. If we're talking about functionality, the SWR calibration feature is what puts this model in the running for as one of the top rated CB radios for truckers. This feature allows you to automatically adjust the antenna for superior reception and transmission. We were also impressed by the display on this CB radio. While the blue channel number isn't bright enough in all lighting, it is easy to see most information on the display. It even gives you a warning indicator if the antenna needs an adjustment. The Midland 1001Z is a more simplistic CB radio, but it's a great pick for the truck driver who doesn't have a lot of room in the cab. It's one of the smallest CB radios on the market right now, but it still offers some advanced features that a truck driver needs. One of those features is the RF gain, which allows you to adjust the sensitivity. This is important because it cuts out a lot of the interference and static that comes from the surrounding environment. You do get a smaller display with this radio, which comes naturally with the compact design. It's still one of the best CB radios for truckers because it offers clear reception and has the basic features that are needed when you're on the road. The Cobra 29 LX model is in the running for the best CB radio for truckers because of its oversized display with four color options for the backlighting. You can take one glance at this display to track all important data without scrolling or squinting. We were also impressed by the functionality of this radio, and it comes with all the advanced features that modern truck drivers demand. This includes access to 10 NOAA weather channels to ensure that you always know when you're driving right into the storm. This radio also includes scanning, so you can find active channels and keep your ear on all activity without taking your hands from the wheel. The built-in diagnostic feature is also valuable because it gives you easy access to data regarding your microphone and battery. As a truck driver, you probably look at CB radios more seriously than many other users. You're not purchasing a radio to play around with at home, and your use of the radio isn't limited to picking up emergency alerts for incoming storms. 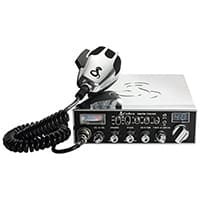 The best CB radio for truckers is the one that offers clear reception and transmission all the time. If your radio is overloaded with static for even a moment, you may miss an important message regarding a blocked highway, an incoming storm or traffic delays. Weather Channels – At one time, truckers depended on information transmitted by fellow drivers to predict the weather coming up along the highway. Today, the best CB radios for truckers include at least a couple weather channels that provide faster and more reliable information. Automatic Noise Limiter (ANL) – This is an advanced feature that limits the static in the background, ensuring incoming transmissions are clear. Most CB radios now offer this feature. Scanning – Some cheap CB radios sacrifice this feature, but it's essential for truck drivers. It allows you to keep your ears on all active channels without manually flipping through the inactive channels. The best CB radios for truckers are also durable because trucks go over a lot of bumpy roads and are used more frequently than radios owned by casual users. Finally, backlighting is important to ensure that the display is easy to see for those late-night runs. If we had to pick one model as the best CB radio for truckers, we would go with the Cobra 29 LTD CHR. It's been upgraded over time based on feedback from professional truckers, and many drivers are attracted to the look and feel of the unit.